After making my slaw the other day I had a bunch of red and white cabbage still laying around the house, and I started thinking of things I could do with it for dinner. The first thing that obviously pops into mind is stuffed cabbage, but honestly I can’t stand traditional stuffed cabbage. It’s so boring and it brings back memories of going to Grandma’s house and everything stinking of boiled cabbage. But wait, what if I put a little twist on it? What if I do it with Asian flavors and keep the cabbage a little crisper so it’s not a soggy mess… hmmm. Sounds good to me! You might be wondering what I mean when I say to “ribbon” the carrots. Very simple, peel them, then use the peeler to slice the carrots along their length to create ribbons, periodically rotating it so you do not have ribbons that are the full width of the carrot. Or if you have a mandolin you can use a large julienne setting to achieve this. In a large bowl combine all of the ingredients listed under stuffed cabbage, with the exception of the cabbage. Use your hands to mix everything together very well, then place in the fridge to set. This is something you could do the day before and keep in the fridge covered in plastic wrap over night, it would allow the flavors to really build. Bring water to a boil in a large sauce pot. Peel leaves from the head of white cabbage and boil them just long enough to soften, 1.5-2 minutes. You want them pliable, but not soggy. You’ll need 12 good sized leaves to use as wrappers. Allow the leaves to cool slightly. Place approximately 1 1/2oz of filling into each leaf. To roll the the leaves tuck in the sides, fold the top of the leaf (closest to you) over the filling and roll away from you. Picture that you’re wrapping up a sub, hoagie, torpedo… whatever you call it in your neck of the woods. Same idea. Place the rolls in a 9×13 baking pan with the loose edge of the leaves facing down so they don’t unravel. Pour the chicken stock and soy sauce over the cabbage rolls, cover with aluminum foil and bake for 1 hour. The noodles are quick and easy, so there’s no need to start it until you have 20 minutes left on the cabbage. Bring salted water to a boil in a large sauce pot. Boil your pasta for 2 minutes less than the instructions on the box recommend. While the pasta is boiling, heat the olive oil at medium-high in a deep sauté pan or medium sauce pot. Add you garlic and sliced mushrooms, sprinkle with 1/2tsp salt, cook until they start to brown. Add the red cabbage, carrot ribbons and peas along with 1/2tsp each of salt, black pepper, ground ginger and garlic powder. Continue to cook at medium heat, stirring periodically. Once the pasta is finished, drain and add to the vegetables, along with the soy sauce and honey. Reduce temperature to medium-low and simmer until the stuffed cabbage is done, stirring periodically. Add your chopped scallions just before you pull the cabbage out of the oven. Once the hour is up go ahead and plate. 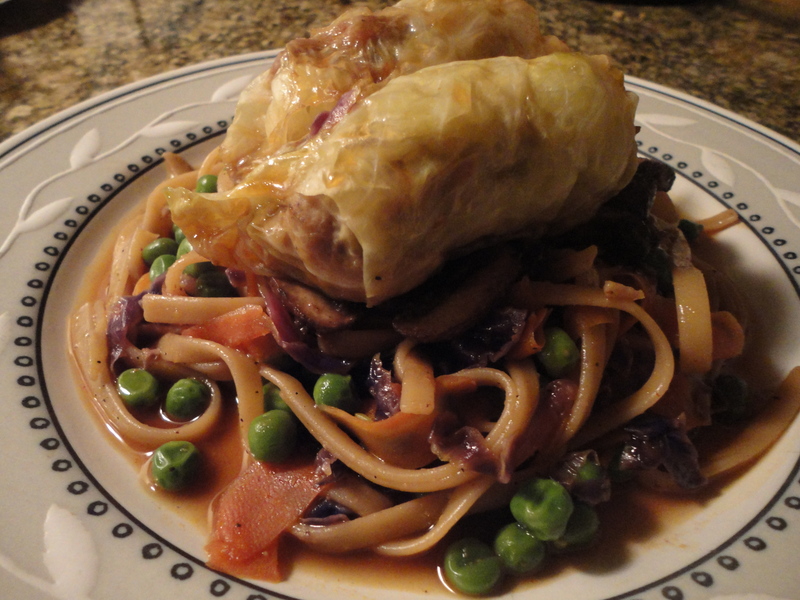 Personally I put the pasta down as a nest and place the stuffed cabbage on top. Ladle some of the juices from the baking pan over the rolls. As far as wine pairings go, I find that lightly sweet white wines or Sake’s are ideal to pair with Asian cuisine. Here are four bottles that I would strongly recommend. So there you have it. A kickass twist on boring old stuffed cabbage along with some great wines and a Sake to pair it with. More new content will be coming soon. In the meantime crack open some slightly chilled Sake and have yourself a good time. Life is short, enjoy it! Tags: asian food, asian fusion, asian stuffed cabbage, stuffed cabbage. Bookmark the permalink. Previous post ← My famous slaw… get ready for summer! This recipe sounds Ah. Ma. Zing. Pinned for future reference – thanks for sharing!